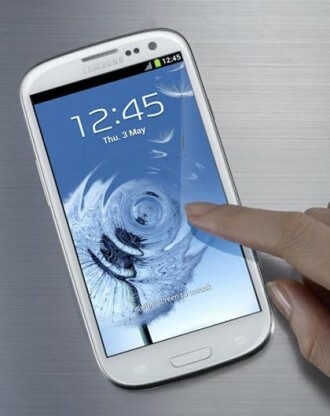 Samsung has announced plans to bring their flagship Galaxy S III smartphone to the US this month through five different carriers. The bad news is that it won’t be the same quad-core handset already available in Europe and India. The phone will be available through AT&T, U.S. Cellular, T-Mobile, Verizon and Sprint with the latter three offering the phone starting on June 21 for $199.99 with a two-year service agreement. T-Mobile specifically said they would offer the Galaxy S III in both metallic blue or ceramic white. Samsung’s new flagship launched in Europe on May 29 complete with a quad-core 1.4GHz Exynos processor and a GPU that is 65 percent faster than the one found in the Galaxy S II. The US version doesn’t have the Exynos processor, but rather a dual-core Qualcomm Snapdragon S4 clocked at 1.5GHz. Samsung says that the dual-core processor features similar performance to the quad-core part without sacrificing battery life. While that may be true, consumers are also losing bragging rights that a quad-core handset would deliver. It's worth noting that the same thing also happened with HTC's One X as it was downgraded to a dual-core for the US launch. Processor aside, the phone remains untouched with a 4.8-inch HD Super AMOLED screen operating at 1280 x 720 resolution with Gorilla Glass 2.0 coating, 1GB of RAM, an 8MP rear camera and a 1.9MP front-facing lens. The phone is compatible with 4G LTE and HSPA+ 42 networks and comes preloaded with Android 4.0 Ice Cream Sandwich. Does the exclusion of the quad-core processor affect the probability that you would buy this phone, granted you had your eyes on it since the overseas launch last month?